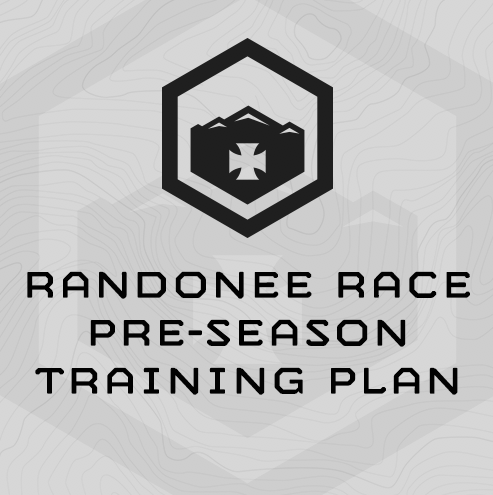 16-Week sport specific training plan for Randonee Racing (Ski Mo) designed to prepare randonée racers for the their first race of the season or an effort up to 4 hours in duration. *** The soul focus of this training plan is to train your aerobic base and aerobic capacity for skinning uphill. It also includes one day of boot packing, but the focus is on uphill skinning. This is a 6 day/week training plan. Randonée races are won on the uphill. Thus, this training plan emphasizes skinning efficiency and stamina for efforts up to 4 hours. We use five Zones to describe training efforts in this plan. Most endurance athletes use heart rates ranges to define the different training zones. If you don’t have your specific heart rate zones you still need to use a heart rate monitor. Simply use (220-your age) to find your maximum heart rate, then calculate 60-68%, 68-75% and 75-82% of that number for heart rate ranges you’ll use for this plan. These are percentage of Max Heart Rate Zones (%MHR). If you’ve been lactate tested and have current heart rate zones we encourage you to apply your known Zones to this plan. This plan employs Zones 1-5. (1) 2 Hours Zone 1. Part (1) Go out for 2 hours, saying in your Zone 1 the entire time no matter what, uphill, downhill, flat. Stay in Zone 1. Also, understand that it may take 10-20 minutes for your body to warm-up and for your heart rate to come up. That’s fine. Don’t rush it and don’t go out too fast. Give your body time. Let’s say your 32 and about to do this session. 220-32 = 188. That’s approximately your maximum heart rate per minute. 188 x 60%, and 188 x 68% = 112 – 128 beats per minute, which is your target training range. This is an interval session from Week 6, designed to develop your lactate energy system. Part (1) is simply 15 min. in Zone 1 to warm-up, and you want to use this time to get into a rhythm and elevate your heart rate to the top of Zone 1 by the final 5 minutes of the time. Take the athlete from above. Their MHR is 188, so for this part, their range is 112-128. Part (2) is started immediately after the 15 min. from (1) ends. You will increase your effort until your heart rate reaches Zone 5. It will probably take you 3 or so minutes to get there on the first interval, and that’s ok. Avoid going too hard in an attempt to get your heart rate up. This will cause your muscles to tire out before you heart can catch up with their effort. Gradually increase your effort, let your heart rate reflect the change, then adjust from there. You’ll get very good at this over time. Every subsequent interval will become easier to attain the target heart rate, yet harder to maintain since you’ll be fatiguing. The target training range for these intervals for our example athlete is 165-179. If he’s in that range, he’s getting the training desired. After six minutes, let off the gas and let your heart rate drop to less than Zone 1 or right at the bottom of it. If you’re ski bounding, this simply means slowing down to a light effort. If you skiing, you’ll slow down for a minute or two but keep skinning to let your legs rest a bit. If you have plenty of hill in front of you, keep skinning in the bottom of Zone 1. If not, transition as quickly as possible and ski down to a point where you can complete another interval. You’ll want to gauge your transition so that you can put your skins back on, readjust your boots, and start right as the 9 min. mark shows on your watch. This is a tempo session form Week 9. Tempo intervals build your aerobic endurance at it’s threshold before your lactate system starts doing most of the work. These efforts are close to race pace and about what your average heart rate will be at the end of a race. Week 9 is deep into the season and you’ll be skiing/skinning for every session. Part (1) is a 20 min. warm-up in Zone 1, find a hill you can skin up or boot pack continuously for 20 minutes in Zone 1. Part (2) is the tempo intervals for 25 minutes. For our example athlete, they’ll perform these at 141-154. Time your transition so that you can can be back down the hill by the end of the rest interval. Part (3), then finish the session with 50 min. in Zone 1-2. **Notes: if you run out of hill for any of these intervals, transition, ski down, transition, and begin again. Count your time skiing down towards your total training time. You may also ski down on your skins to save time taken by transitioning. Starting during Week 6, every Sunday, you should boot pack one of the tempo intervals, if possible. The duration of each session is at the top of the table cell for that day. What if I start the program late – closer than 16 weeks prior to my first race? Understand this training plan is progressive – the training sessions increase in difficulty as you work through the plan. If you’ve been training before starting this plan, work back in time from your first race date and start there. You’ll know after the first week if the volume in the plan is too much – if so, drop back a month in the plan and try again. If you have not been training, start with this plan’s first session. What should I do on a rest day? Rest. Take a nap. Eat. Improvement in sports is a balance of stress and recovery. Rest and proper nutrition are as much a part of your training as is the physical efforts. Rest days aren’t just rest days from skiing/skinning, but all reasonable physical activity. Fatigue accumulates. Rest does not. If you don’t rest when you’re supposed to, it will hurt your performance. Ski Bounding is trail running with ski poles. If you can skin – do so, but it’s likely early in the season there won’t be snow for skinning. If this is the case, we recommend ski bounding as an alternative. If you can’t or won’t ski bound for some reason, cycle. Does this plan include a taper? Yes. This plan includes a taper to your race. (3) 35 minutes Zone 1-2.